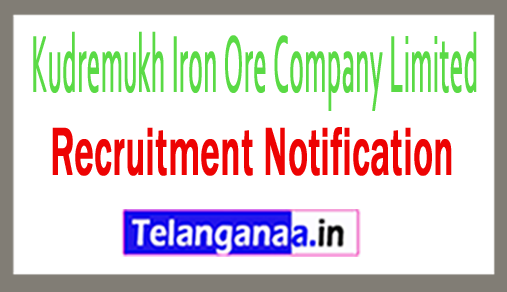 Kudrumamukh Iron Ore Company Limited has issued an advertisement related to the latest career designated as KIOCL Recruitment. Through the online process application invites applications and 12 job vacancies from the dynamic job applicants, for the participation of the company secretary in various disciplines. Job seekers who think that they are eligible, they have to apply for KIOCL jobs. They have to submit the form before the end date of September 30, 2018, through online mode. Job seekers can get other relevant information about KIOCL recruitment 2018 through this page which is well presented by the team of www.telanganaa.in. SC / ST / PWD / ex-servicemen will be exempted from payment of application fee. The maximum age of candidates applying for jobs is 53 years (post 1), 48 years (post 2), 41 years (post 3), 37/31 years (post 4), 41 years (post 5-7), 40 Year (Post 8), 35/30 years (post 9, 10) till 31-07-2018. Approval: Successful recruitment of applicants for the manager, company secretary will get attractive and impressive salary of Rs. 51,300 - 73,000 / - (post 1,2), Rs. 32,900 - 58,000 / - (post 3), Rs. 24, 9 00 - 50,500 / - (post 4), Rs. 20,600 - 46,500 / - or Rs. 32,900 - 58,000 / - (5 posts), Rs. 32, 9 00 - 58,000 / - (6,7 posts), Rs. 70,000 / - (8 posts), Rs. 60,000 / - or Rs. 50,000 / - (9, 10 posts) from the organization. Visitors have to go to the official website to apply for KIOCL and this is http://www.kioclltd.in. A list of this latest opening link will open and the candidates will have to select the most appropriate link which will open the full ad, which will contain more information about KIOCL vacancies. Candidates should take the printout of the deposit application form and the application should be completed in all the dates at the address given below to the full date. Date of filing of online application form is started: 04-09-2018. The last date for submission of online application form is: 30-09-2018. The last date for submission of hard copy of the application form is: 06-10-2018. Click KIOCL recruitment notification here.